When it comes to the fishing rod and reel, you have to make sure you get the best product that your money can acquire. Angling is best when you use quality items; a good fishing rod must be durable, sturdy and it should be responsive as well. Which is why you should do your research first before buying one. Thankfully, we now have online reviews that we can depend on to make all that searching for the great stuff easier. For this review, we are going to tackle Sougayilang’s Spinning Telescopic Fishing Rod. Fishing and angling to this day remain to be a popular hobby. Because of its steady popularity, it has produced a lot of options when it comes to fishing tackle. Regardless of your angling or fishing skills, determining the proper tackle for the kind of fishing activity you are into can be a difficult task due to the wide availability of products from a variety of brands. Quality fishing equipment for your angling trips will be based on the locations in which you frequently fish, the manner in which you fish and the kind of fish that you are after. You will need a rod and reel combo that will give the most comprehensive applications for your needs. You should opt for a product that provides the most adaptability – thus an excellent rod will make those fishing experiences more enjoyable and fun. A rod that is mediocre when it comes to quality might entail common problems that one encounters when fishing like tangling and knotting. These issues must be avoided at all costs in order for you to enjoy the most and relax while fishing. 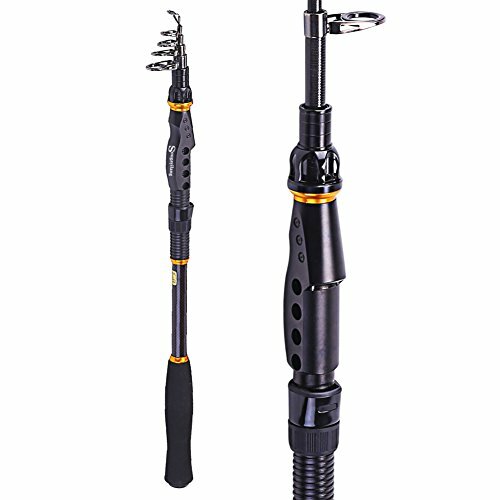 A rod and reel combo like the Spinning Telescopic Fishing Rod from Sougayilang is a great means to fish compared to purchasing a rod and a reel individually, since this particular combination is made to work as a single unit. One of the answers to an effective rod and reel set-up is going after a balanced, well-made product that will operate efficiently and give its users a solid performance. Rods are usually composed of graphite or fiberglass material. This Sougayilang rod and reel is made with carbon, which means it is lightweight, responsive/sensitive and quite flexible. These attributes are crucial for fishes that tend to bite lightly,but at the same time, graphite and carbon materials are also sturdy enough to handle bigger game fishes. The next factor that you have to consider is whether you need a saltwater, freshwater or multi-purpose rod. The saltwater kind is designed for saltwater locations, as its name implies, and it has several features to maximize the fishing rod’s performance, especially when it comes to harsher conditions. The saltwater pole is also capable of backing up heavier weight, thus it can support stronger lines. Freshwater rods, meanwhile, are water-resistant at most, but not resistant to corrosion. These rods usually support 4-10 pounds of line since the fish will be smaller and anglers will not require longer poles. The Spinning Telescopic Fishing rod is made for both saltwater and freshwater locations, so with this product, you will get the best of both worlds. Rods that are designated for both saltwater and freshwater spots often sport a higher weight capacity and have saltwater-resistant features as well. It is the ideal rod to use for pier fishing or fishing on the shore, so if you plan on doing any of those activities, you will benefit from using this product. Customers who bought the product and were satisfied with it agreed that the rod and reel combo was excellent. Many appreciated its striking classic silver design. Most customers were content with the durability it displayed, and its flex and adjustability were noticed as well. The pole does not lock down when withdrawn, thus the manufacturer provided it with a tiny plastic cup item that prevents it from expanding by chance. When the rod is extended completely, the separate pieces secure solidly into position and haves durable feel to it. The reel has a smooth spinning action and does not display any resistance. It was a bit stiff when adjusting it from casting to the reeling approach; however, it will work loose with regular use. The drag works decently and can be modified in a snap. The product also gathered some complaints from customers who gave it an average feedback. One customer said that the claim that it can lift 10 pounds of dead weight was inaccurate because he was not able to do that. Another customer complained that while the product displayed an excellent backbone, once it was expanded to its maximum size, the last 2 feet of it would not draw back, thus making the rod at risk from breakage. A different customer was also concerned when the bottom handle came loose after only a day of use. The Sougayilang Spinning Telescopic Fishing Rod is a great item for people looking for a rod that can be used in both saltwater and freshwater locations. This one is made with carbon, thus it is lightweight yet still strong and powerful enough to go after larger game fish. Many customers have provided the item with positive feedback due to its great performance, durability, and responsiveness. The majority of customers recommended the item for simple, regular fishing game. You can take the Sougayilang Spinning Telescopic Fishing Rod to a pond or the river and wait for sunfishes and crappies to go straight to the lure. It is also an ideal item for traveling due to its smaller size. You can just place it in your vehicle’s trunk and it will not require plenty of space.